"SHLICHUS - THE BIRTHRIGHT OF EVERY CHOSSID"
The reputation of Ronald O. Perelman, Chairman and Chief Executive Officer of McAndrews and Forbes Holdings, Inc, precedes him as a global business leader with diversified holdings in consumer products, entertainment, financial services, biotechnology and gaming. Less well know, but of signal importance to the well being of the world as a whole and Jewish life in particular, is Mr. Perelman’s partnership in the work of the Lubavitcher Rebbe and of Chabad-Lubavitch worldwide. As the Rebbe wrote to him in 5749 (1989) “I thank you for you part in this partnership, a “part” which – as in true partnership – is more than a slice of the whole, but actually a share in the whole." Mr. Perelman serves as National Chairman of American Friends of Lubavitch, and actively supports the international Chabad-Lubavitch movement which runs over 3,000 centers in 45 states and over 70 countries. 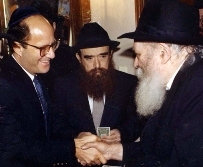 Nearly 20 years ago, in 5747 (1986) Mr. Perelman was largely responsible for launching the Rebbe’s “14 Million Klal Yisroel Fund” – an effort to embrace all of the world’s 14 million living Jews (may their number increase) – by contributing 18¢ for every man, woman and child. He is also credited with making possible Campus Chomesh, home of the Beth Rivkah Schools and flagship of the Chabad-Lubavitch educational system which educates thousands of Jewish girls. Campus Chomesh is the fountainhead from which the shluchos – Chabad women emissaries – received their education and preparation for a lifetime dedicated to the needs of far-flung Jewish communities the world over.